Chef Special Vegetarian Dishes There are 9 products to choose from. 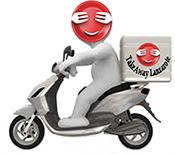 Takeaway Lanzarote - Restaurants Playa Blanca Lentils tempered with seasonings and herbs. Takeaway Lanzarote - Restaurants Playa Blanca Black lentils cooked with onion, tomatoes, butter and cream. Takeaway Lanzarote - Restaurants Playa Blanca Chickpeas treated with Masalas, cooked in rich curry sauce. Takeaway Lanzarote - Restaurants Playa Blanca Florets and diced potatoes cooked with onion and tomatoes in pickle Masala, fairly spiced. Takeaway Lanzarote - Restaurants Playa Blanca Diced potatoes cooked with spinach puree. Takeaway Lanzarote - Restaurants Playa Blanca Fenugreek leaves tempered with seasonings and diced potatoes.